The Centurion: Why did you start training in martial arts, and how old were you? Mackensi Emory: I started martial arts when I was six. Originally, I was a gymnast. I grew up doing dance and gymnastics. My mom’s a school teacher, and one of her students in her class had a gold card for a buddy class, and he asked if I’d like to go. So I joined him, and did a buddy class at Kovar’s Satori Academy. From the first moment I stepped on the mat, I loved everything about martial arts. We had a black belt club, and I joined that. I was in the splits club— I joined everything that you could do. I also joined the demo team, so that introduced the sport karate aspect of martial arts to me. With my gymnastics background, some of the tricking came a bit more easily to me, but it was still difficult to transfer over some of those moves into karate. I loved that challenge. TC: What got you into competition? ME: As part of being on the demo team, I did belt promotions, and demos, and fairs – different things with Kovar’s. That’s how I was introduced into the tournaments. It all took off from there, and I built my way up, starting with the local circuit, then I did NBL (National Blackbelt League) and Tiger Claw, and worked my way up into the NASKA (North American Sport Karate Association) circuit. The rest is history! TC: You’re also a member of Team Paul Mitchell Karate, which is awesome! How did you learn about the team, and what were some of your original impressions? ME: Several of my original coaches – Matt Emig, Caitlin Deschelle, and Rudy Reynon, who what the one that got me started on kamas – were on Team Paul Mitchell. I would see Team Paul Mitchell competitors on stage every tournament, stacked in all of the divisions. Some of their coaches would walk around the rings and talk to me, like Coach Steve (Babcock) and Coach (Chris) Rappold, and Coach Damon (Gilbert). They’d say hi to me, and they’d say, “You’re really good; keep training hard and maybe you’ll be on the team some day!” That was motivation for me to train even harder! Team Paul Mitchell is the top team on the circuit. I wanted to be on the team from the moment I joined the NASKA circuit. TC: So how long have you been on the team? ME: I was approached by Team Paul Mitchell karate at the end of 2013. They actually approached me and Tyler Weaver, and asked us if we’d like to join. So about five years. TC: What’s it like to be on Team Paul Mitchell? ME: It’s great! It’s really cool that a lot of my friends, other top competitors, are on the team with me. It makes it a really friendly environment, and it’s really cool that we get to do the (Martial Arts) SuperShow together, travel together, and compete and see each other all the time. In competitions, it’s always fun to join together and do a team sync or a team demo…to put our brainpower together to come up with a really cool demo to show everyone. TC: Do you have any family members who train? ME: No, I’m the only one! 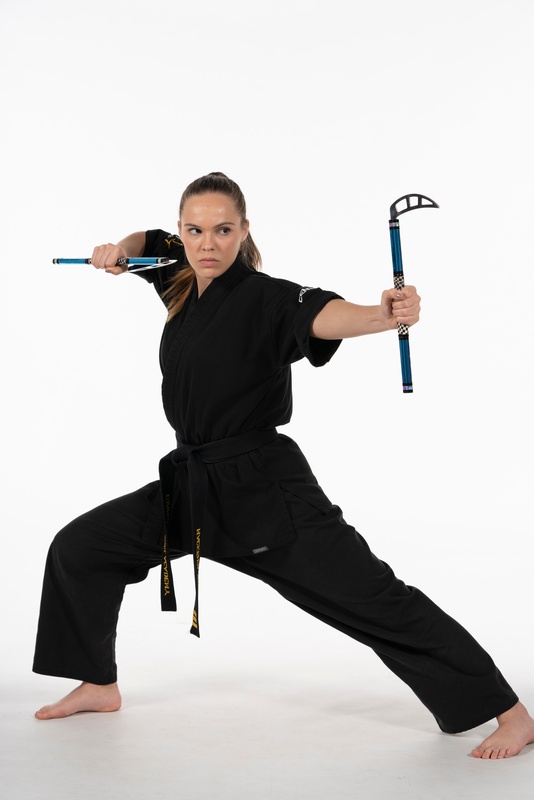 One of my sisters tried martial arts for a little while, but she didn’t love it. So now it’s just me. TC: You mentioned this earlier – although you’re known in sport karate for your kama routines, you also train and compete in traditional sword forms as well. Does it ever get confusing to train in two different styles, with two different weapons, at the same time? ME: Doing two weapons does make my training a little more complicated. I have to set time aside to really switch my brain over and practice both, but it’s really just part of being a top competitor and managing your time. So, I’ll go and I practice my kamas, go through all my divisions and do what I need to do for that, and at the end of my practice, or sometimes as a warmup, I’ll go over my sword. I also like to practice extreme sword, just for fun, even though I don’t compete extreme sword – it adds a different element to the practice. But, yes, it does kind of get complicated when you’re practicing two different weapons for competition, but because it is traditional versus extreme, I don’t get them confused too often. I just enjoy both so much, so it makes training fun, and it doesn’t seem like work because I like it so much. TC: Speaking of kamas, though, earlier in 2018 you launched a Signature Series Kama line with Century. These are the same kind that you use in competitions, and you designed them from scratch. What sets them apart from other kamas? ME: I kind of created a kama that kind of fits my personality. 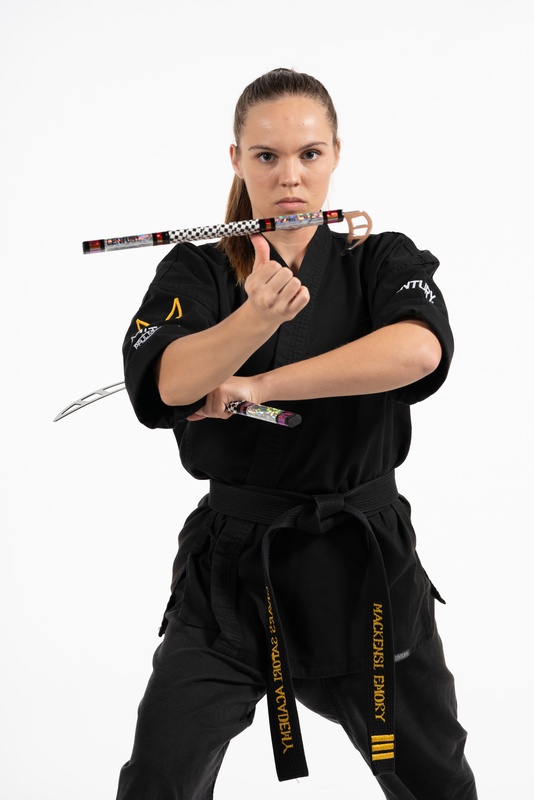 I designed them with what colors I wanted, and what tape, what the blade looks like, what grip tape…I wanted something that looked different from everything else on the circuit, and that’s what I wanted to share with everyone else. The checkerboard grip tape is kind of my signature; you don’t see that very often, if at all, on the circuit with competitors. I worked really hard to find a good weight for my kama, and a good, nice, clean blade that will help you stand out, looking sharp onstage and in your competitions – something unique that brings a different style to your forms. TC: Besides competitive sport martial arts goals, what are some goals you’ve set for yourself going forward? ME: The next big goal that I have for myself in my future would be to get into the stunt industry. I really want to tackle the entertainment industry, and try and become a stunt woman. I think that’s the next thing that I’d really, really like to do. I’d like to be able to bring the aspects of tricking that I already know how to do of into the stunt world, and also, at the same time, continue teaching and competing, and working with Century. TC: Some of the biggest movies out there that use stunt doubles are, of course, superhero movies. With that in mind, if you could have one superpower what would it be? TC: Dog or cat person, or both? ME: Oh, I think I’m both a cat and a dog person! I’m probably more of a dog person, but I have a dog and a cat as of right now. Both of my pets are just so friendly and so nice, but my dog likes to sleep on my bed with me, so that’s why I think I’m more biased towards being a dog person. I think I also like dogs a little more because I can play with them. My cat’s a little moody – you know cats. TC: Awwww, what are their names? ME: My dog’s name is Jax, and my cat’s name is Cleo, because she has two black lines that go out from her eyes, kind of like Cleopatra. TC: Most and least favorite food? ME: I could live off pasta. That’s my favorite, above all. 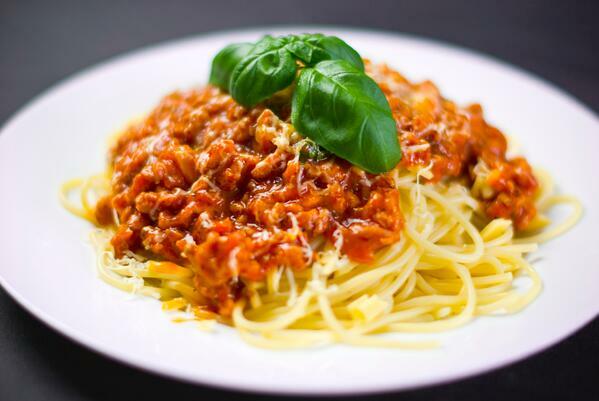 Any type of pasta. Olive Garden is my place to go. My least favorite food would be anything really spicy. I’m not really a spice person. I’m working my way up, though! I’m trying to build my tolerance, but anything really spicy, I try to stay away from. TC: What’s something not a lot of people know about you? ME: I’m actually a pretty good artist. Outside of doing martial arts, that’s kind of my escape. I’ll be in my room and I’ll just get my paints out. I really like to draw and paint. I typically use acrylic paint; I haven’t really dabbled in oil paint yet. But I love drawing and just expressing myself in a different way on canvas.